Clear away mental, emotional and physical clutter so you hear the Messages from your Soul. The aim of Soul Coaching® is to align your inner spiritual life with your outer life. 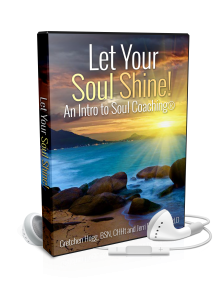 This audio series is an introduction to the Let Your Soul Shine! Soul Coaching® The 28 Day Journey. • Discover your authentic self. • Unlock your life purpose. • Embrace hope, healing and joy. • Attain clarity through cleansing mental clutter with the Air Element. • Create inner peace by emotional clutter clearing with the Water Element. • Connect with your beautiful spirit within with the Fire Element. • Clear the physical clutter with the Earth Element. To learn more about “Let Your Soul Shine!” Soul Coaching® The 28 Day Journey, click here.